John Christian Bechler: Sing hallelujah, praise the Lord! Summary for the Busy Executive: Joyous album. In the 18th- and early 19th-century United States, one would have undoubtedly found the most sophisticated music-making, oddly enough, in the wilds of West Virginia, North Carolina, and southeastern Pennsylvania, among the Christian sect of the American Moravians, essentially Czech and German Hussites transplanted. If I recall correctly, the first American performances of Haydn chamber works, symphonies, and Die Schöpfung – at the time, let's not forget, Advanced Modern Music – came from them. They also wrote by far the most competent music on this native ground. The New England and Southern singing-masters forged a new idiom, in part because they had little grounding in the old one. "City" composers like Francis Hopkinson or James Hewitt confined themselves to genteel voice-and-keyboard ditties or elementary variations, and even there often had trouble constructing a simple phrase which didn't trip over itself. On the other hand, the Moravians knew their stuff. They wrote chamber music, choral music, choral-and-instrumental ensemble music, much of it in the style of Handel and Haydn. Like the influence of the Moravians themselves, however, the music seldom made it out to the culture at large, less the doing of the Moravians themselves and more the lack of effort by that culture to seek it out. The Moravians have kept tremendous archives of musical material, which scholars have combed through for performing editions. Periodically, performers have brought part of this huge legacy to life and light, but for some reason it has never stayed in notice for long. Here's hoping Pearlman hits it lucky. Music played a great part in their services, particularly at the major Christian feasts or commemorating major events (like the end of the Revolutionary War). This disc concentrates on their functional religious music. Few pieces run more than two-and-a-half minutes, but all are shapely, many even beautiful. Original texts run both to English and German, which undoubtedly reflects the linguistic makeup of the community. Pearlman has organized individual pieces into "Lovefeasts" (Liebesmahl), a Moravian service of worship that consisted almost exclusively of music. 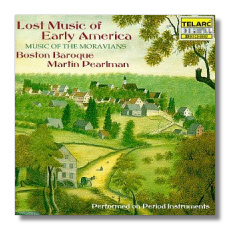 As with everything else I've heard from them, Pearlman and the Boston Baroque do an outstanding job here. The choral and instrumental work (period instruments) is first-rate. Sieden and Baker sing with pure tone and true, perhaps a bit naïve, fostering the illusion that they're just very good local soloists. Furthermore, their tones match, so that in their duets they sound like the emanation of one being. For me, although not specifically designed, this is a perfect Christmas album. The combination of strings, massed trombones (for hymns), choir, and soloists for some reason put me in the mood of the season – snow and sugarplums. You also get a freebie: a second disc of Pearlman talking about the music, with musical illustrations. How can you pass this up? The usual Telarc creamy sound suits these pieces very well.